Platinum Wedding Services. . . Assist with wording and proof stationery, menu cards, invitations, save the dates, etc. 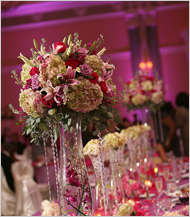 Complimentary mock up table centerpiece through floral decor company. Recommend live musicians for ceremony and cocktail hour. Contact all service vendors for arrivals times, set-up locations, unloading and tear down. Attend tastings and menu selection meeting with catering manager. Attend final meeting with catering manager to cover menu selections, banquet set-up and timeline. Assist with selecting your welcome baskets and favors. Provide hotel accommodation information and group room block rates. Review banquet event order and final details with service providers. Confirm all linen, floral and rental orders. One week prior to event: Distribute client approved timeline to all service providers. Confirm with musicians on song selections for ceremony and reception. Manage banquet staff regarding staff and compliance of floor plans. Direct ushers with program distribution and seating. Set-up seating cards, sign-in book, favors, menu cards etc. Coordinate with DJ/Band on establishing Grand and Formal Entrance, Cake Cutting and Bouquet and Garter Toss. Be on site and manage entire wedding day. Handle any outstanding payments to vendors. Additional assistants will be required for larger groups, multiple locations or weddings larger than 300 guests. 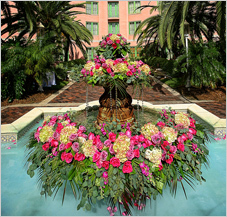 Above services are included in all of our All-Inclusive Wedding Packages. For a complimentary consultation contact us at 813.774.8635.